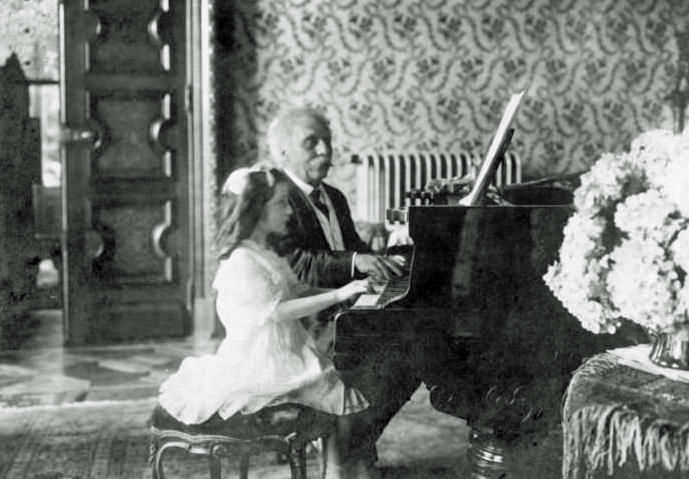 Fauré at the piano, playing four-handed with another little girl known as Mademoiselle Lombard, around 1913. Hi Kids Commuters! We’re glad you’re joining us for Kids Commute from Interlochen Public Radio. We hope your week is going well, and are happy that Kids Commute is the soundtrack for your school year. This week, we’re listening to Gabriel Fauré’s “Dolly” suite, composed in the late 1800s. As we’ve learned in this week’s shows, Dolly isn’t actually a doll and the second movement, “Mi-a-ou” isn’t about a cat. Today, we learn that the “Kitty Valse” (or waltz) isn’t actually about a cat either! So what gives? Find out in today's episode! Have you figured out the answer to this week’s Quizlet? Great! If you haven’t quite figured it out yet, don’t worry. We’ll give you one more hint right after the music in today’s show. Text us the correct answer, and we’ll send you a Kids Commute Prize Pack. KC 278 - DOLLY WEEK! Thursday: Today, we'll hear the "Kitty Waltz" from the "Dolly" Suite - yet another piece from this suite that sounds like it's about a kitty - but isn't! Meow? Welcome to the mid-week episode of Kids Commute from Interlochen Public Radio. Our theme this week is "Dolly Week" - but we’re not talking about Barbie or G.I. Joe action figures. “Dolly” is a suite of music with six movements written in the late 1800s by French composer, Gabriel Fauré. KC 277 - DOLLY WEEK! Wednesday: Today, we take a walk through "Le jardin de Dolly" or, "Dolly's Garden!"